Here's to Julia, who taught me to cook, and cook French. And to Edouard, who taught me to cook French fast. Both are stained and worn from 30+ years of meals for J and our 3 kids. Still mastering the art. And still enjoying it. The great Lyon chef Pierre Troigros has for four decades made a jeweled salmon with sorrel--a dish that started the French food revolution, really. This has similar flavors using similar ingredients. The presentation is much less elegant (here is what Martha Stewart does with Pierre's marvel). As for the taste, judge for yourself. Sorrel is amazingly easy to grow. I planted some 20 years ago in the herb garden, and it's still going strong, from April to November. Just a few torn leaves give a salad a lemony tartness. And a chiffonade makes a great garnish. It makes me feel like I really can garden. Heat a 'fait tout' (Dutch oven) or large skillet on high (ideally one with a glass cover) and add the peanut oil. Salt and pepper the filets on the top (skinless) side. Add the wine, stock, cream, scallions and lemon juice (use less if you use sorrel). Boil for four minutes. Lower heat, add sorrel or spinach and cook for one minute, then off heat and swirl in the butter, in bits. Pour the sauce around the fish and serve. Heat a 'fait tout' (Dutch oven) on high (ideally one with a glass cover) and add the olive oil. Using a garlic press, smear the top (skinless) side of the filets with garlic. Sprinkle with herbs and Cajun seasoning. Salt and pepper. Saute the filets, skin side up, for two minutes or until lightly colored. Add the spinach (or sorrel) and the wine. Cover and steam for four minutes. 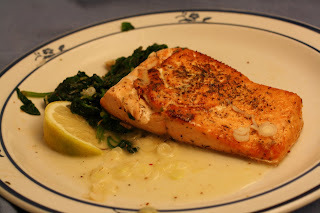 Remove the filets and spinach (or sorrel) to a plate(s). Add the cream or sour cream, and squeeze one tablespoon lemon juice in, holding the seeds back. Stir rapidly, boiling, until the sauce thickens slightly. Pour the sauce around the fish and over the spinach (or sorrel). Serve with lemon wedges. skin side down. Remove to a warm plate. Add the spinach and scallions. Cover, and melt for two minutes, tossing frequently. Add salt, pepper, and lemon juice. Remove to a warm plate. Add 1 tablespoon chopped scallions and 1/4 cup white wine (or red wine or champagne). Boil one minute or until reduced almost to a syrup. Off heat, and swirl in 2 tablespoons butter, cut into bits. 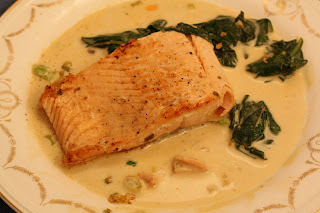 Nap the salmon with the sauce, and garnish with green scallions or parseley.